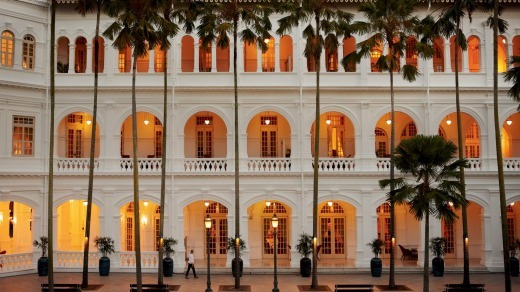 Raffles Hotel has been synonymous with Singapore since the 19th century. Having been there on numerous occasions, I can only assume it's going to be more of the same – but better – when it reopens this August after a major renovation. I love the colonnaded courtyards, the circular driveway, the white liveried and turbaned doormen, the Long Bar, the Tiffin Room and the must-drink Singapore sling, the towering Livistona palms, the shopping arcade and the gift shop, where you can buy an affordable souvenir to prove you've been there. To suggest that Raffles is iconic is a cliché, but it is also iconic of Singapore in a less flattering way. The building was threatened with demolition in the 1980s, when the government wasn't noted for its conservation policies, prior to gaining recognition as a national monument in 1987. In a quest for modernisation, much of Singapore's colonial heritage was bulldozed before the realisation that a bit of history was essential as a tourist attraction. While vast swathes of this island nation are now reflected in the glass walls of skyscrapers, there are still enough genuinely interesting remnants of the old "raffish" Singapore to make up an itinerary for the visitor looking for something a little bit deeper. Just inside the mouth of the Singapore River is Boat Quay, the original Port of Singapore, which operated until its demise in the 1980s. Now you'll find a row of riverfront Victorian buildings, or "shophouses" and "godowns", repurposed as restaurants fronting outdoor dining spaces with an amazingly varied range of cuisines: Japanese, Chinese, Italian, American, Thai, Indian, Vietnamese, Malaysian and plenty of Nonya dishes. 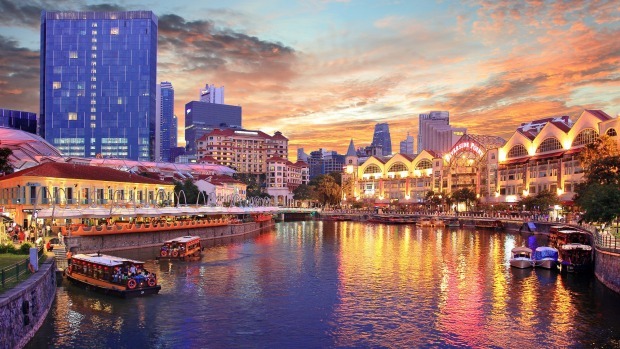 Further upriver is Clarke Quay, also once home to traders in bumboats, but now featuring a distinctive array of dome-shaped umbrellas suspended from hoops in front of more bars, restaurants and nightclubs. Aside from the subcontinental dining options, there are several Hindu temples, a mosque dating from 1859 and a variety of colourful Indian shops. And it does light up during Diwali season. Definitely worth a visit. Another area steeped in history, this land was sold to British forces in 1850 as the site of Tanglin Barracks. After being leased to the private sector in the 1990s, the area developed a reputation as a bohemian enclave and was rebranded. The 40-hectare site is now a foodie destination with a great selection of sophisticated shops and galleries offering antiques, epicurean products, design items and a pet hotel. Among the food offerings is Candlenut, the world's first Malaysian Peranakan restaurant to be awarded a Michelin star. There's also a curry house, a tapas buffet and a farm-to-table diner. For a similar experience, check out Holland Village – or Holland V as it's known by locals. This is another area which was inhabited by British military types before finally becoming a cultural quarter selling artisan goods and fashion, and offering pub and restaurant destinations. 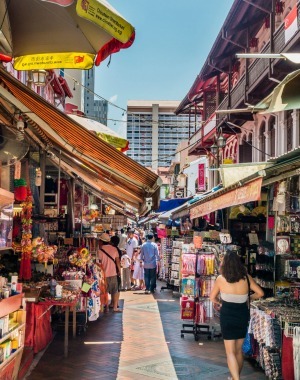 Singapore's Chinatown is its largest historical district and where you'll find any number of sights and sites worth visiting. Attractions include temples, cultural attractions and hawker food. The latter includes Liao Fan, which claims to offer, at about $3, the world's cheapest Michelin-starred meal – soy sauce chicken rice. ​ This historic complex (pronounced "chimes") is unlike any other in Singapore. At its centre is a neoclassical church surrounded by green lawns, fountains and courtyards. Inside are yet more restaurants, bars and cafes, as well as a fitness club, massage therapy spa and beauty salon. The former convent and school has intricate plasterwork, frescoes and stained-glass windows imported from Belgium in its hall, and holds a UNESCO Cultural Heritage Conservation gong. So, while Singapore has a deserved reputation as one of the world's most modern cities, there are parts of this tiny island nation that would still be recognised by Somerset Maugham, Noel Coward and Rudyard Kipling – just some of its more famous visitors.